A middle-aged man attacked by a shark off the Taranaki coast just on dusk last night was patched up by a couple of vets before heading off to see a doctor. Peter Garrett, a New Zealander who has lived in Ireland for the past 15 years, was surfing 100m offshore at the Arawhata Rd surf break a few kilometres north of Opunake when he was mauled about 7pm. LUCKY ESCAPE: The bite marks left by a shark are clearly visible on Peter Garrett's lower leg. The photo was taken by one of the men who patched him up. Mr Garrett, home on a three-month holiday, suffered 10 lacerations, about 2cm deep, but was able to paddle clear. Matt Thomas and James Bruce, who work as vets in Manaia and Eltham respectively, were surfing nearby when they saw and heard Mr Garrett panicking. The men followed Mr Garrett ashore when the shark turned its attention toward them. When they got to shore Mr Garrett showed them his wounds and they went to get medical supplies from a work vehicle. “We got some iodine and some bandages and fixed him up. He said he’d go straight to a doctor,” Mr Thomas said. Mr Garrett felt dizzy when he got out of the water but hadn’t checked in to the emergency department at Taranaki Base Hospital last night. The vets, who took photographs of Mr Garrett’s wounds, said he was still able to walk and thought he was OK to drive. “He was bleeding quite a bit, you could tell from the teeth marks it could’ve been more serious,” Mr Thomas said. 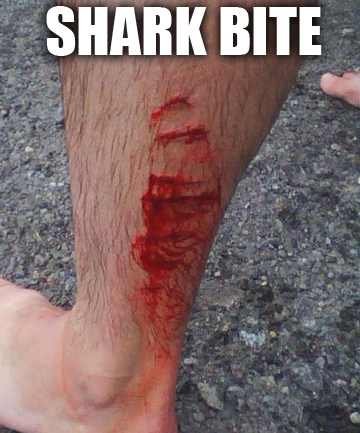 Mr Bruce said although surfers occasionally saw sharks in the water, it was unusual for one to attack. Neither of the men knew what kind of shark it was. “It could be the return of the Taranaki terror,” Mr Bruce joked, referring to a six-metre great white that hounded fishermen during a couple of recent summers. He said surfers should keep an eye out for the shark.